Knock knees, also known as genu valgum, is a type of knee alignment seen when a child (or adult) stands up straight with their knees together, but their feet and ankles stay apart. The opposite type of alignment, called bow legs (genu varum), is when someone stands with their feet and ankles together, and there is a gap between the knees. Knock knees are usually assessed by directly measuring the angle of the shin bone to the thigh bone (tibiofemoral angle) or by measuring the distance between the ankles (intermalleolar distance). Sometimes photographs or x-rays can be taken to calculate these measures. Knock knees (and bow legs) are a normal part of a child’s growth and development. The classic pattern of changes at the knee with age in Caucasian children is bow legs at birth, straightening out at two years, going into knock knees at four years, and straightening out between six to 11 years. There might be some ethnic and gender variation to the timing and severity of knock knees. For example, the knees of south Indian children tend to straighten out sooner after birth, and go into knock knees earlier but with less severe angles. Girls seem to show a higher knock knee angle than boys at all ages. However knock knees can be a problem. While most cases are a normal variant of growth (physiological knock knees), further investigation is needed (pathological knee knocks) if the knock knee angle is large, if they appear late or worsen after eight years of age, occur on only one leg, are painful or cause a limp. What causes pathological knock knees? Pathological knock knees can occur in some neurological conditions, such as cerebral palsy or spina bifida, as a result of the altered muscle pull on the bones. So pathological knock knees may be one of the early signs of an underlying disorder. 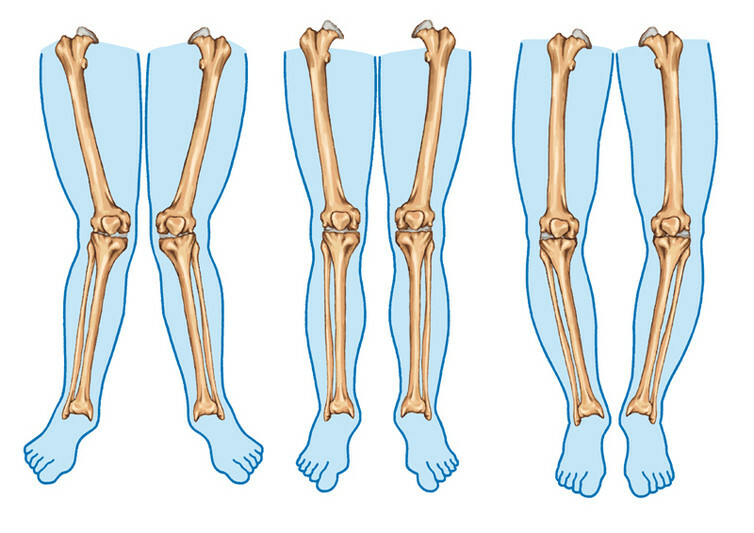 Bone diseases resulting from poor mineralisation, such as rickets, may present through large knee angles during childhood. When pathological knock knees are seen in combination with short stature and other bone and joint misalignment, a skeletal dysplasia or metabolic bone disorder may be the cause. Obesity during adolescence is also associated with more severe knock knees, and is more commonly seen in children with flat feet and those with hypermobile (overly flexible) joints. Do they have to be treated? It is usually parental concern for the way a child looks when standing or walking that sparks initial review by a health professional. Children presenting with physiological knock knees do not require treatment or ongoing monitoring, as they will grow out of it with time. Conservative treatments may be beneficial such as exercises and weight loss programs to reduce obesity and improve knee movement in children, or knee braces and foot orthoses for painful osteoarthritis associated with knock knees in adults. However, these interventions require more scientific evidence to support their use as there currently isn’t much. Children with severe or worsening pathological knock knees might need orthopaedic surgery to correct their knee alignment, particularly in the presence of persistent pain or disability, regardless of the underlying cause. There are many operations for pathological knock knees. A hemiepiphysiodesis is a type of “guided growth” operation involving the placement of staples or a plate on the inside part of the knee to slow down growth while the outside part of the knee continues to grow. This then corrects the knee angle to a straighter position. A study reporting outcomes two years after this operation showed correction in 34 of 38 knock knees. Another surgical procedure for pathological knock knees is a wedge osteotomy, where the top of the shin bone or bottom of the thigh bone is cut and a small portion removed to correct the knee alignment. In a study of 23 adolescents and adults with painful arthritic knock knees, a wedge osteotomy was found to show improvements in walking ability and alignment after two years. Orthopaedic surgery is rarely needed. For most kids, knock knees are just a normal part of growing up.